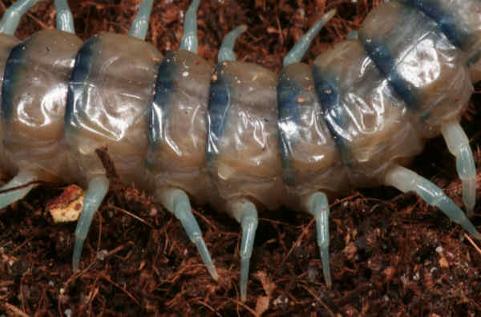 The head of a centipede has some eyecatching features: The first legs are transformed into poison claws (maxilliped, ). These are fixed under the head plate (cephalic plate, ) with the eyes (ocelli, ). Only the members of Scutigeromorpha have compound eyes, all other Chilopoda have simple eyes (six or more). The mouth part (mandibles, ) is used to bring the food to the mouth. In front of the head are the two antennas (antennomere, ) for the navigation by sense of touch. 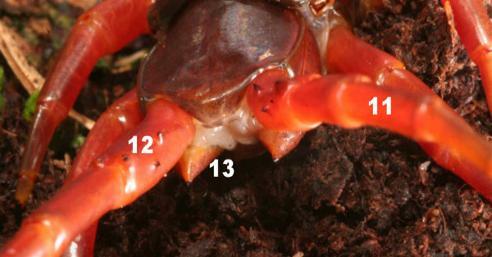 At the side of the centipede are the pleural zones () with the spiracles () which are the ports of the breathing organs. The pleural zones are bordered with the upper tergites () and the lower sternites (). The legs (locomotory legs, ) rise out of the pleural zones. The back side of the centipedes is dominated by the final legs with prefemur, femur, tibia and tarsus (). Important are the spurs and the prefemoral spine (). Hidden under the final legs there is the coxopleural process with the coxopleural spines (). The pictures above show a female Scolopendra subspinipes dehaani. If you watch the underside of the head of a centipede, you can see the following details: The antenna segments can be divided into basal segments  which are hairless and a little bit stronger in their structure and the following segments which has very small hair and are very smoothly. Directly behind the mouth, there is the teethplate with some teeth . 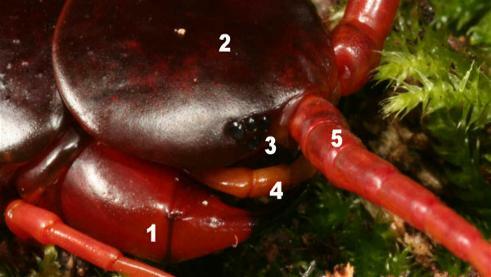 The pictures above show Ethomstigmus spec. from Tanzania. 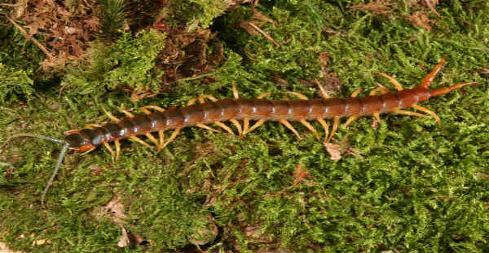 Centipedes are common animals which are found nearly anywhere: under stones, in leaves, soil and even in garbage dumps. Some specialised species also live in caves or other specific places. All places are imaginable, which give the centipede protection from dehydration, safety from enemies and provides enough food. 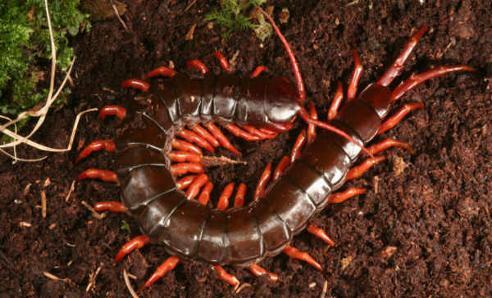 Centipedes live alone and are mostly active in the night. In the darkness, they begin searching for good places and hunting for food. As they are poisonous, beside invertebrates they can also defeat larger animals like mice, birds, lizzards. They are silent hunters. When they catch the prey, they ram their poison claws inside the preys body while holding it with the first four or five pairs of legs, so that it can not escape. About the centipede poison, there are not many informations yet. Some expert guess that the main substances in the poison are histamin (hormone and neurotransmitter, starts allergical reactions) and serotonin (indolamin, affect the blood pressure). Maybe there are some more enzymes, which p.e. cause the bad pain. While there are many bite reports annually, there are just some deadly bite reports. Most of the deadly bite reports cause on secondary infections. Because of their hard chitin shield, Chilopoda need to molt for growing. For the molting, the animal needs silence and a not too humid climate. After peeling away the old chitin shield, the new one is risk of injury because it is soft and damp. The cure takes some hours, while the centipede is an easy prey to its enemies. Mostly the centipedes eat their old chitin shield as the first food after molting to recoup several mineral nutrients (so they do not need to hunt during the cure process which might be a danger for the centipede).